Bowers & Wilkins is not the kind of company that sits on its laurels. It is the kind of company that likes to innovate, with every new range you get new technologies or tweaked technologies from the range above. The latest 700 series is a perfect case in point. We get a newly developed tweeter and bass/mid cones developed for the 800 diamond series. The 700 series range consists of 8 models. 3 stand mounts, 3 floor standing models and 2 centre speakers. The new tweeter is not aluminium which has been the go to material for Bowers and Wilkins ranges below the 800 series for a long time. The new tweeter, featured in all of the 700 series speakers, is a carbon design which extends the upper range of the tweeter to 47khz. This gives the listener a much cleaner musical image plus more subtle details thus bringing you closer to the musical performance. The floor standing models are all three way designs which feature a midrange driver derived from the 800 series. The smallest in the range is the 707 standmount. It is a fantastic little speaker with a surprising amount of bass for its size. Midrange is superb and the detail from the carbon tweeter exceptional. Next up is the 706 standmount. It is bigger than the 707 so would suit a larger room. You will get decent levels of bass and a wonderfully detailed in room experience. The last standmount in the range is the 705. The design of this speaker takes performance to the next level. The tweeter has its own enclosure which sits on top of the box containing the bass/mid. The benefits of this arrangement are immediately obvious when you listen to them. The soundstage gets bigger and even more in the room with the sound appearing to hang in front and around you. If you want a speaker at this price point, even if you think you want a floor stander, then these are a must listen. The Bowers & Wilkins 704 is first of three floor standers in the 700 series (Note as the size of the speaker goes up the number given to it goes down). As it is a floorstander, you get more bass than the stand mounts. Not only that but you also get a dedicated mid-range driver resulting in, unsurprisingly, a better mid-range performance. This is a slim speaker that is very room friendly with just a few compromises compared to bigger speakers for example the 703. Same configuration as the 704 but not as slim. This gives room for bigger drive units and results in a bigger sound with more depth to the sound stage. The biggest in the range is the 702. Here again we see Bowers & Wilkins moving the tweeter to its own enclosure on top of the box. The results are much the same as with the 705 standmount. It’s immediately obvious with the speakers disappearing, leaving just the music floating unobstructed around the room. You still have till the end of March to bag yourself a fantastic deal and receive up to £400 worth of Chord Company cable when you buy a pair of 700 series loudspeakers. For details click here. We have partnered two of the most respected brands in Hi-Fi together to create a fantastic sounding Hi-Fi system for under £3,000. We have paired the extremely well reviewed Naim Uniti Atom £1,999 all in one music streamer with the new released compact B&W 707 speakers £799. The Naim Uniti Atom is a compact, stylish, music streaming system in a single box. Amongst its features are UPNP streaming, Internet Radio, Spotify, Tidal and Chromecast, combined with a high quality amplifier, make it a remarkable sounding and versatile piece of hi-fi. The B&W 707 standmount speakers are the smallest speakers in Bowers & Wilkins new 700 series range that recently replaced the popular CM range. The new 700 series employs trickle down technology from their flagship 800 series. They come in 3 attractive finishes, real wood rosenut veneer, gloss black and satin white. The range counts down to the biggest 702 model (£3299) which along with the 705 (£1799) have the distinctive tweeter on top, separated from the main cabinet. When paired together the two make a very compact and capable music system, with a big presence. The combination offers plenty of insight into the music and a surprising amount of bass weight, and should work very well in a small or medium sized room. We have this set up on demonstration at Audio T Portsmouth, so why not pop in for a warm beverage and have a listen in our comfortable demonstration room. Thanks for reading, Nick, Joe and James and we hope to see you in store soon. 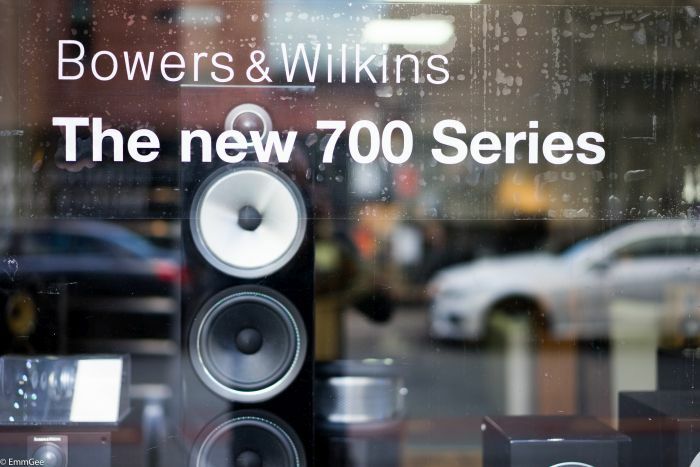 Introducing the new 700 series from Bowers and Wilkins. Our eyes are usually first to draw an opinion and we like what we see. 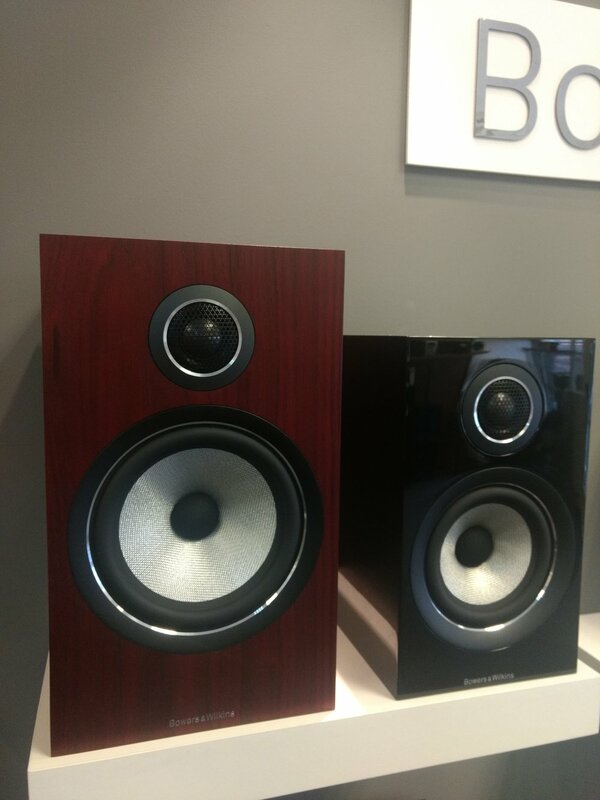 Bowers & Wilkins have always had a reputation for creating some of the most undeniably beautiful and great sounding speakers on the planet i.e. Nautilus. The brand new 700 series has not been neglected nor skipped in design or quality and should be enough to convert anyone who isn't a fan of 'big speakers'. B&W have ditched their distinctive yellow cone for a slicker silver and black one and they do look the business. The 700 series cabinet is quality as always, shown here in gloss black but it is also available in satin white and rosewood finishes. The new range also utilises tech from the flagship 800 series, which is stocked at out our Cardiff branch. Most notable is the new carbon coated tweeter, similar to 800 series but at less cost. Aerofoil bass cones, were developed using a computer and which varies the thickness and gauge of the drive unit as the distance from the centre phase cone increases makes big improvements to bass response. Aerofoil tech is taken directly from the 800 series. 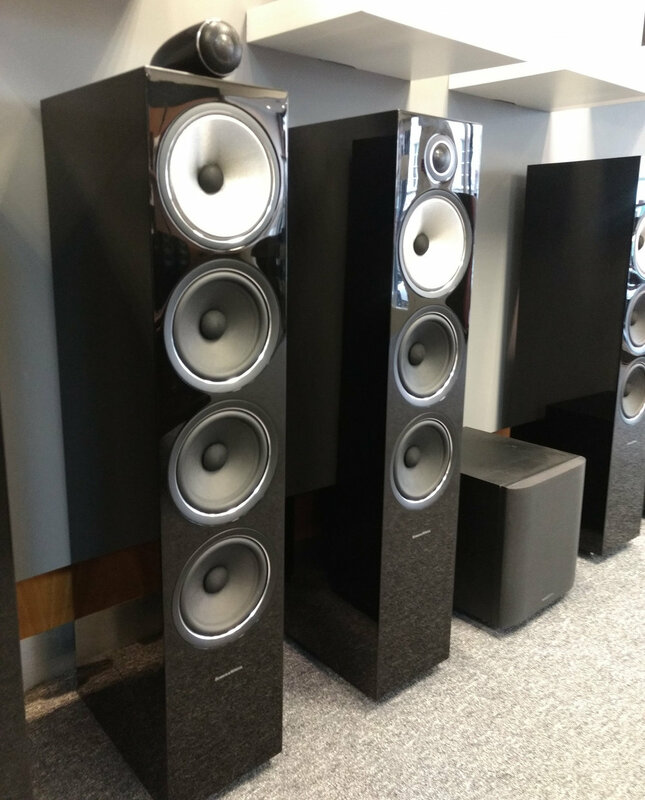 The B&W 703's are out on display and now in our demo room in Manchester. B&W have developed a new mid drive unit using a patented technology called Continuum weave technique, which is very lightweight but also tough and it makes the mid driver very easy to manipulate when dealing with the break up of mid range frequencies. Other notable changes, which again, stem from the 800 series include decoupling the mid range unit. Since mid range frequencies are what we are most receptive to, for example, vocals and talking, this is where we are going hear things that don't sound quite right, which is more commonly referred to in the Hi-Fi world as colouration. 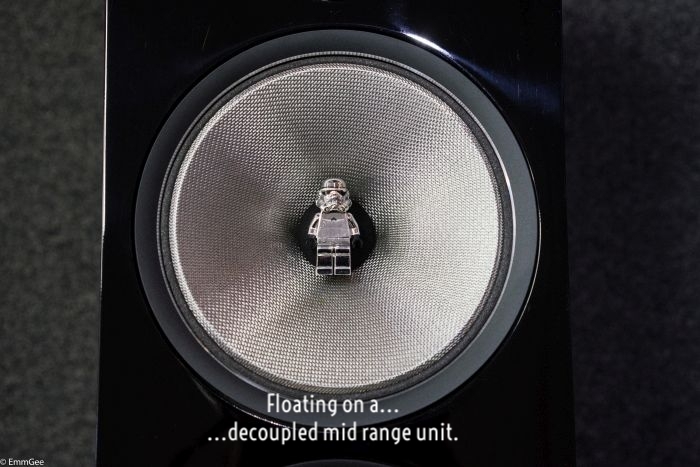 By decoupling the mid drive unit from the cabinet, which will be vibrating predominantly from lower frequencies, this isolates and drastically reduces any transient/ interfering harmonics generated by the other drive units, which results in a clearer sound quality. Chromey is taking full advantage of the new floating drive unit in the 700 series. Chill out dude, chill out. 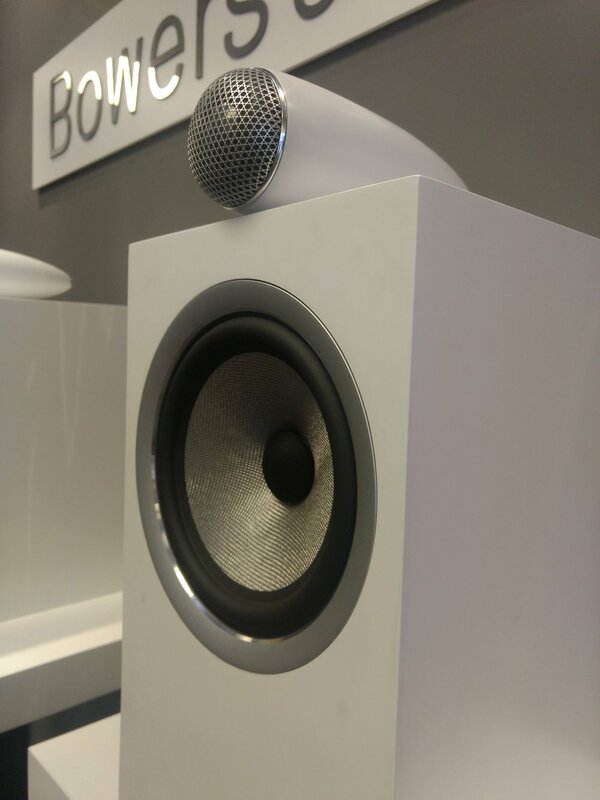 Bowers and Wilkins have also added two centre speakers to the new range. The new HTM72 S2. and the larger HTM71 S2 which will be added to our range later. Our new 700 series is out on display and ready to demonstrate. Pop over to Audio T Manchester and take a look and listen. Dave, Simon, Mike, Haden and Munir should be on hand to help. Bowers & Wilkins loudspeakers and Hi-Fi are available from the following branches of Audio T.
The S2 700 series replaces and improves upon the CM Series and benefits from technologies used in the studio-grade 800 Series. Bowers & Wilkins have gone to town on this new range that comprises three floor standers, three stand mounters, a speaker stand, along with two centre speakers and a subwoofer. Available in gloss black, satin white or rosenut. With a Carbon Dome tweeter in a solid body housing on top of the cabinet and a decoupled Continuum midrange and three Aerofoil Profile bass drivers the 702 S2 flagship floor stander is very capable. A slim and elegant floor stander in store that delivers. The 703 S2 sits between these and is available to demonstrate by arrangement. 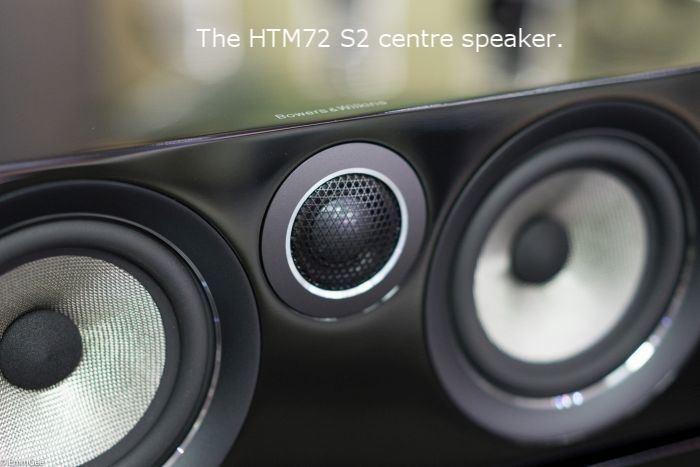 The 706 is the middle of the three stand mount speakers. 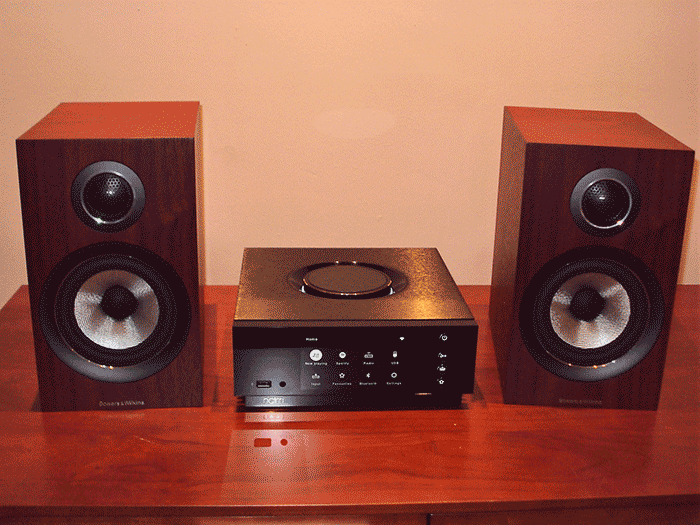 The same mid sized speaker as the 705 S2 that benefits from the top mounted tweeter. The smallest of the 707 S2 Series can be demonstrated with our range of equipment in store along with the others, but you are welcome to bring along an amplifier that you own.